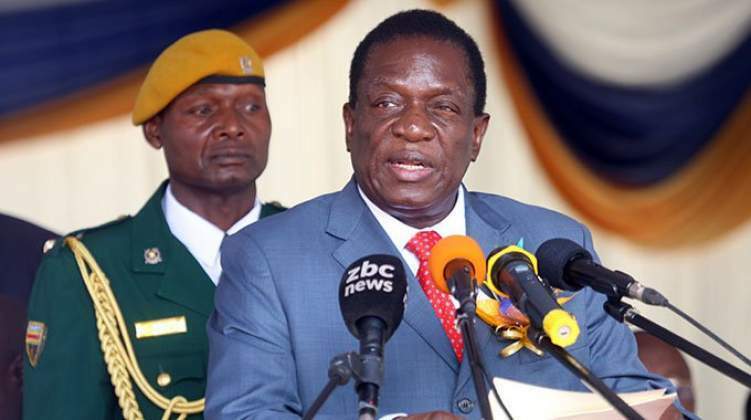 GOVERNMENT will not be distracted by the matter of illegal Western sanctions as it is focussing its energy on reviving the economy, President Mnangagwa has said. The West imposed sanctions on Zimbabwe in early 2000 after the country embarked on land reform to redistribute land to the majority blacks, the owners before colonial occupation by Britain. Addressing thousands of people at a field day at Hilderstroom Farm, owned by Mr Irvene Taguta of the Johanne Marange Apostolic Church in Chipinge yesterday, the President said now was a time to focus on the economy. “We know we have been on sanctions for the last 18 years but we cannot afford to cry day and night,” President Mnangagwa said. “We need to develop our country. We want to revive our economy, our industry, our roads and our rail should be refurbished and we must have a lot of boreholes. But we cannot achieve all this on our own. We can achieve this by attracting investors from outside the country,” said the President. “For investors to come into the country we must have a conducive environment. We then agreed that let us say Zimbabwe is open for business,” he said. “Let us find ways of countering those sanctions and develop our country while those who imposed those sanctions watch. This is what we are looking at and what we are doing as of now. We say Zimbabwe is now open and those who have been our friends during our struggle will remain our friends,” he said. President Mnangagwa said countries that imposed sanctions must reconsider their positions. On agriculture, he said Government was modernising the sector by investing in irrigation equipment. Government has sourced irrigation equipment from Spain and Brazil. India will also be providing some of the equipment soon. He said there were plans to increase soya beans production under the Presidential Inputs Support Scheme next season. “We have put soya beans on Command Agriculture with those in the rural areas expected to receive free soya beans next season. The same plan will be implemented for cotton farmers. They will receive their monies on time,” he said. “I have been talking to Minister (of Agriculture) Perrance Shiri and he told me that they will be soon giving 99-year leases for free to those who befitted during the land reform programme. But he said those who will be given the farms will pay some taxes since they will be supporting farming activities,” he said. Commenting on the hospitals situation, President Mnangagwa urged unemployed qualified nurses to apply for jobs and fill the vacancies created by those who were dismissed for embarking on illegal industrial action. The striking nurses refused to go back to work even after Government availed $17 million to meet their demands. President Mnangagwa said the dismissed nurses ceould also reapply. The President reiterated his message of a peaceful election and that foreign observers were free to come to Zimbabwe. He called on his Zanu-PF party not to impose candidates as the party prepares for the harmonised elections. President Mnangagwa was given a sculpture by visiting Mozambican governor of Manica Province, Mr Alberto Ricardo Mondlane.